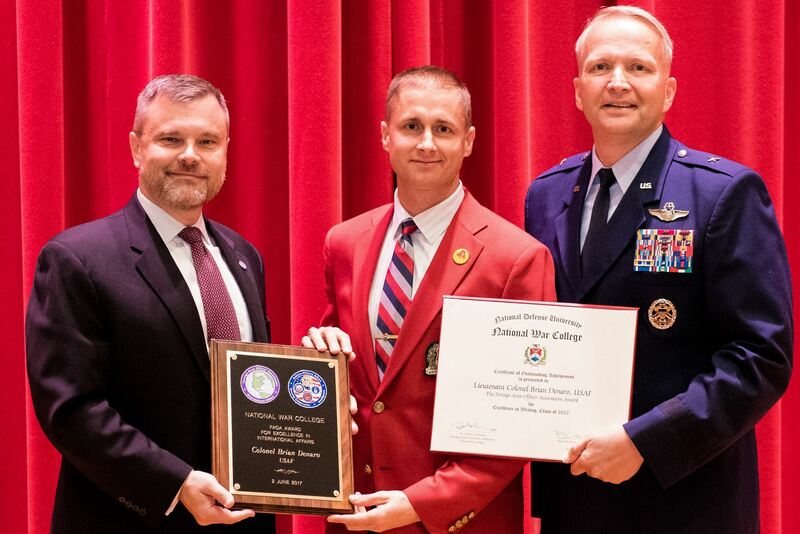 The Foreign Area Officer Association Writing Awards Program officially began in 2012 with five U.S. military War Colleges completing signed Memorandums of Agreement with FAOA - Marine Corps University, Naval War College, Air University, National Intelligence University, and Joint Forces Staff College. 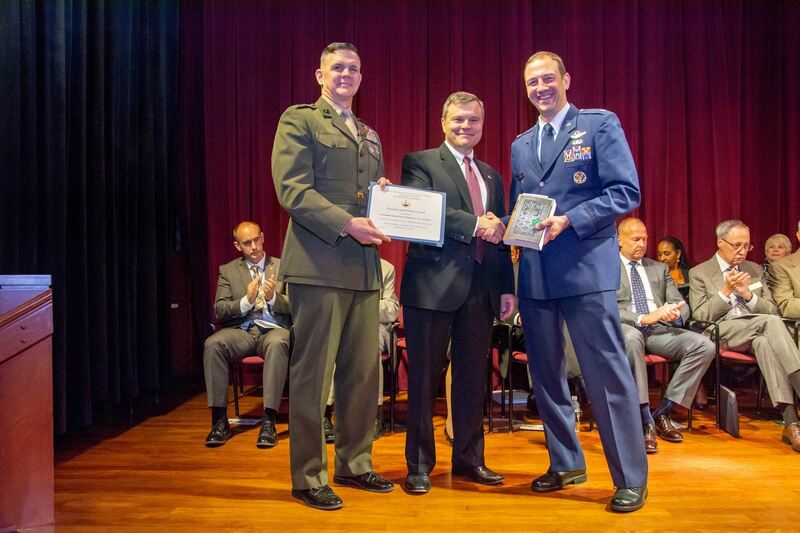 The goal of the FAOA writing awards program is to recognize student authors who have demonstrated outstanding academic research, strategic thought, and professional writing skills on significant international or political/military affairs topics in completion of their graduation requirements. There have been many high quality papers submitted for competition, some to be featured in the FAOA Journal and on our website. Winners receive a plaque or book commemorating their achievement at their graduation ceremonies and also receive a one-year FAOA membership. 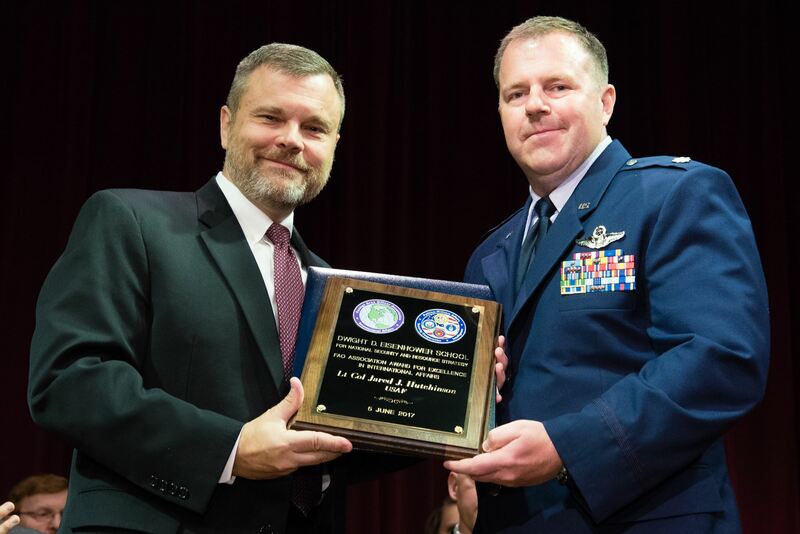 FAO Association Vice President Rob Timm presents the FAOA Writing Award for Excellence in International Affairs to LtCol Eric W. Bucheit, USAF of the Eisenhower School Graduating Class of 2018 for his paper entitled, "As North American Defense Evolves, What Role Does Mexico Play?" 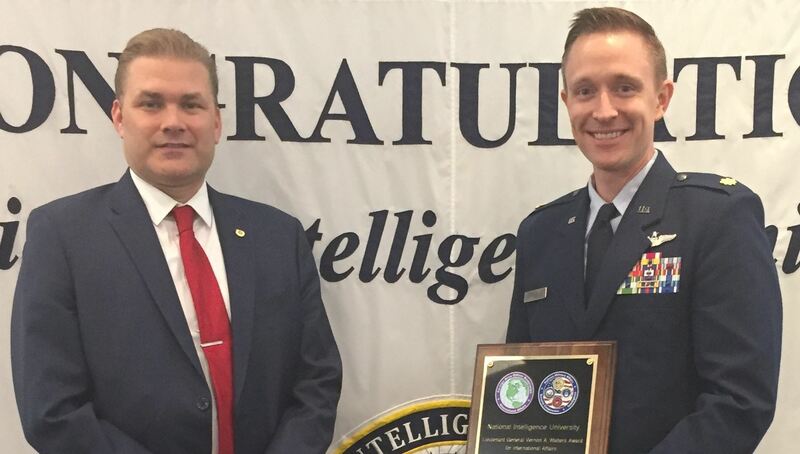 FAOA Board Member Jeff Hoffmann presents the FAOA Writing Award, the Lieutenant General Vernon A. Walters Award for International Affairs at the National Intelligence University for Major Chris Finch, USAF. Thesis title: "The World on Thin Ice: Russia's Hybrid Warfare Strategy Through Hockey."